BRIDGE is the European Commission initiative which unites Horizon 2020 Smart Grid and Energy Storage Projects to create a structured view of cross-cutting issues which are encountered in the demonstration projects and may constitute an obstacle to innovation. 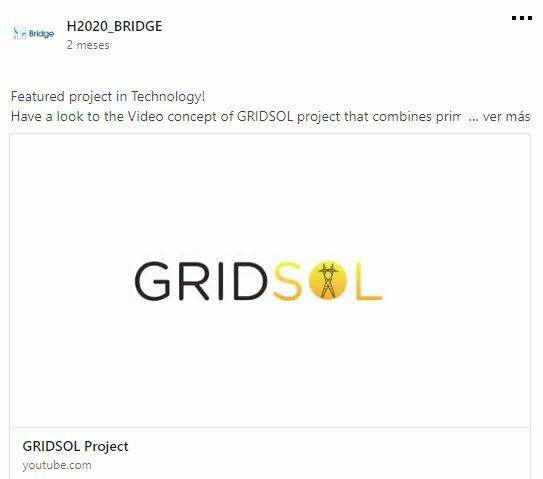 GRIDSOL has joined the H2020 BRIDGE process that fosters continuous knowledge sharing amongst projects thus allowing them to deliver conclusions and recommendations about the future exploitation of the project results. BRIDGE has published in LinkedIn the video concept of GRIDSOL project that shows the primary renewable energy sources and technology under an advanced control system called Dynamic Output Manager of Energy (DOME) supplying secure electricity and contributing to grid stability through Smart Renewable Hubs. The project demonstrates an initiative to support the transition to a clean, secure and efficient European Energy System.